I just had to try Vardon – plus, I really wanted to check out the revamped Stag Hotel after it reopened in October under new consortium ownership and a major revamp. And I must say, it’s a little more classy than The Stag of old. It even has a champagne bar upstairs serving the finest champagnes. Being a champagne lover, I really like the concept, although it’s a bit of a shame it’s adjacent to the dancefloor (best drink there earlier in the evening, me thinks). The restaurant, Vardon (named after Vardon Avenue), is quite different to the former restaurant known mostly for its steaks. The reason I was so keen to get to Vardon is because of chef Camillo Crugnale. I was always a big fan of his food at Assaggio in Hyde Park so I was eager to see what he’d be dishing up at The Stag. The menu’s nicely concise with 7 entrees ($20-$30), 9 mains ($25-$45) and 5 sides. We decided to share a charcuterie plate to start. It’s a great plate. It not only looked good, but I loved everything on that plate! 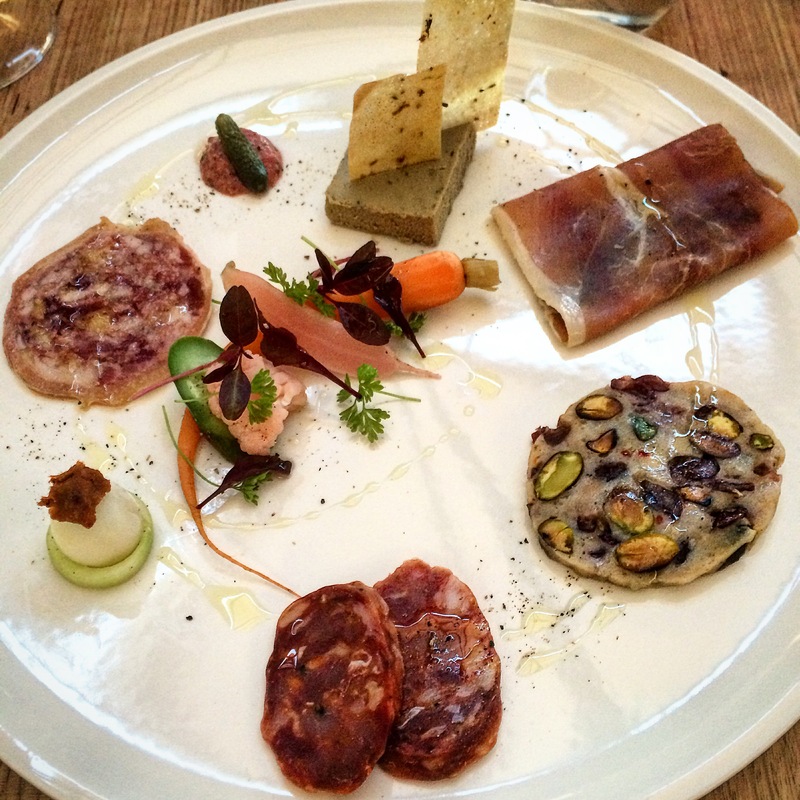 The duck liver pate, the sausage, the proscuitto, the rabbit and pistachio roll – SO good! I will definitely order this again. For entrees we chose the ‘Under – Seas’ which consisted of tuna with watermelon, salmon with spinach, ricotta and tarragon and a bacon and egg pasta tube topped with salmon roe. It was good. Not quite as impressive as the charcuterie plate, but the stand out of this selection was the smoked green mullet scotch egg on curry and mustard – really tasty and the yolk was so deliciously oozy! There should be more scotch eggs in the world, I say. Camillo had become known for his great zucchini flower dish at Assaggio so our other entrée was the Zucchini blossoms with pine nut, peppers and pernod mousse – a gorgeous dish! For mains we had the Lacquered duck breast and Camillo’s other signature dish, the blue swimmer crab pasta which now comes with a roasted lobster sauce and bottarga. Could it get any better? To finish, the passionfruit and lemon curd tart which was really good. We thoroughly enjoyed our meal and were looked after extremely well by Luca and restaurant manager Tom Duggan, formerly of Bistro Dom and Hamilton Island’s Qualia. I’m really pleased that The Stag now has a good quality restaurant. It’s a great addition to Adelaide’s east end and it’s definitely worth a visit. The Stag previously had great pub food not food for small people with fussy taste buds..world renown steak ask the many overseas visitors especially international sporting teams ..plenty of good food not mouthfuls of expensive entrees pretending to be mains..